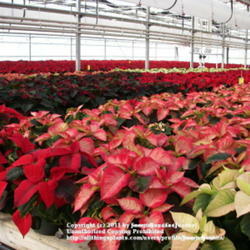 Few plants are as closely associated with any holiday the way the poinsettia is with Christmas. It's an intriguing plant with an interesting history. 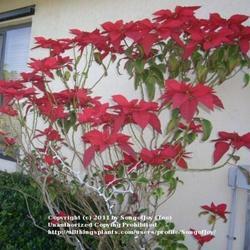 The lovely, red, star-shaped poinsettia is a favorite plant for the Christmas holidays. 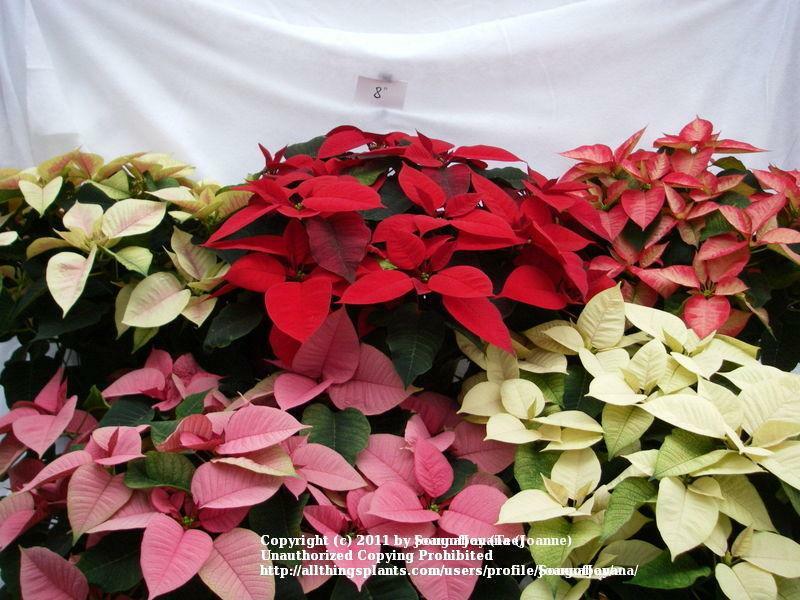 While other colors of poinsettias - pink, white, salmon, and multi-color - are also popular, the red poinsettia remains the Christmas holiday plant of choice. Nothing says Christmastime quite like it. A native of Mexico and Central America, the poinsettia was brought to the United States in 1825 by the first U.S. Ambassador to Mexico, Dr. Joel Poinsett, for whom it is named. 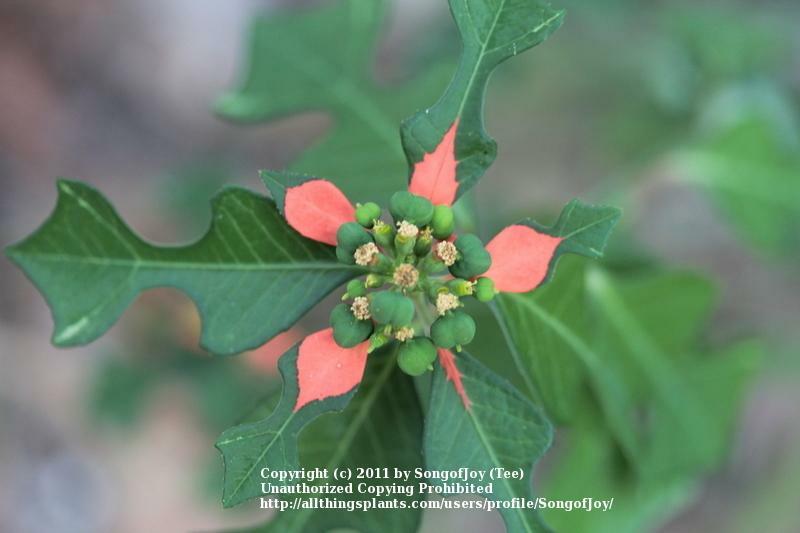 The legend of the poinsettia also originates in Mexico. It tells of a poor girl named Maria and her little brother, Pablo, who eagely looked forward to the Christmas festival each year. The local celebration always included a manger scene set up in the local church. The days before Christmas were filled with parades and parties. The two children loved Christmas but had no money to buy presents or to give to the church for the celebration they so loved. One Christmas Eve the pair set out to attend the service at the church. Having nothing to bring as a gift but not wanting to arrive empty-handed, they picked weeds growing alongside the road as they made their way to the service. In spite of being teased by the other children, they proceeded to place the weeds around the manger scene knowing that was the best they had to give. Miraculously, according to the legend, the green top leaves began turning into bright red petals and soon the manger was surrounded by the beautiful star-like flowers of the poinsettia we recognize and know t oday. Poinsettias belong to the genus Euphorbia which contains a wide variety of both tender succulents and non-succulent species of plants such as the spurges. The species name pulcherrima means "most beautiful", and judging by the plant's popularity, many people would agree with that designation. 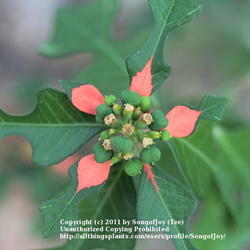 The species is a tall, rangy shrub with large, dark green leaves that are toothed on the edges and pointed on the ends. Flowers of any poinsettia are insignificant compared to the colorful bracts. The flowers are the small yellow structures that appear in the middle of the colored bracts at bloom time. Those colorful bracts are actually modified leaves. 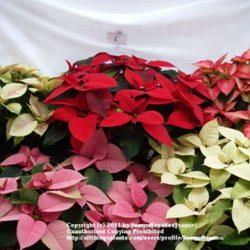 The poinsettias we buy at Christmas are cultivars having larger, more numerous bracts. They are more adaptable to container culture and are easier to dwarf. Mikkelson cultivars were introduced in the early sixties and remained the cultivars of choice for three decades. Today there are as many as 100 cultivars being grown. 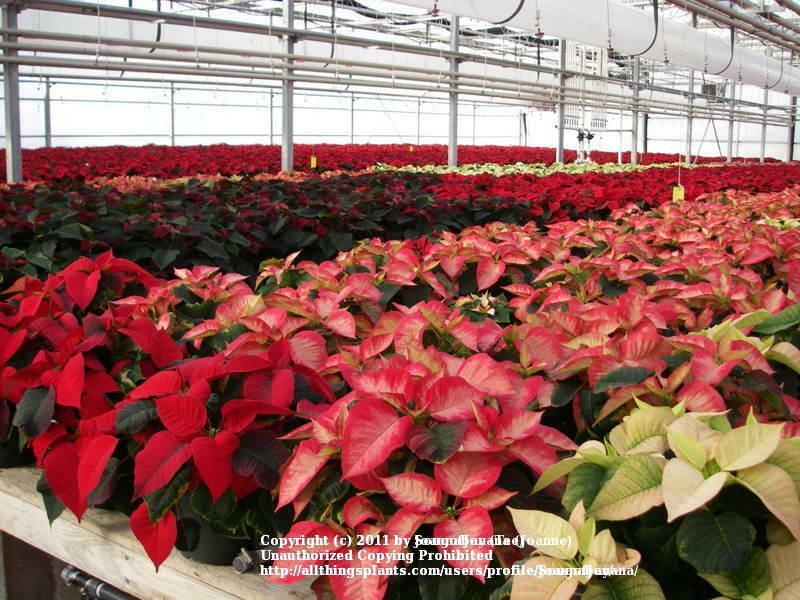 Most commonly sold poinsettia plants are sprayed with growth retardants to limit height and prevent them from becoming top-heavy. They are typically forced into bloom when they are between one and two feet tall. However, when planted in the ground, those same plants can quickly reach a height of 6-10 ft. in a single season. The spread is generally 3-6 ft. Most of the current poisettia production in the U.S. occurs in California. Prior to the 1990s, the Ecke family of Encinitis, CA, maintained a monopoly of the poinsettia industry by virtue of having developed a grafting technique that allowed every seedling grown to develop branches and become a fuller, more desirable plant. At that time, a researcher discovered and published the technique which then opened the door to competition, especially from Latin America where less costly labor could be obtained. 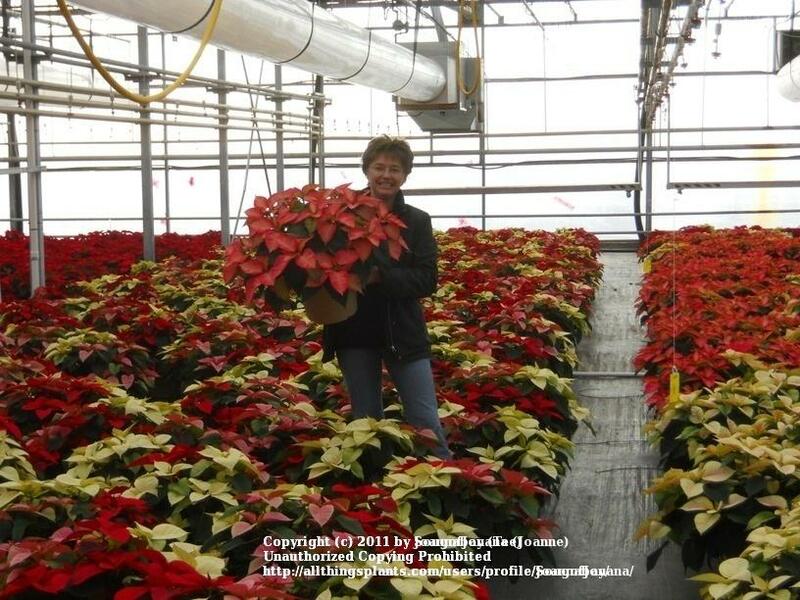 Poinsettias can be grown in the ground or outdoors in containers year around in USDA climate zones 9-11. Mulch them well to prevent root-knot, and always protect the plants from frost. They prefer full sun but will take some shade. Too much shade will result in lanky growth. They have average water needs; however, in order to avoid leaf drop, allow container grown plants to dry out between waterings. To encourage new growth and branching, cut back old growth in late winter before new growth begins. Pinch tips several times before August 15th. Do not prune after that date as new bud nuclei have formed by that time. Also avoid nighttime light sources which can disrupt their bloom cycle. In locations where poinsettias cannot grow outside year around, maintain a potted poinsettia indoors by keeping it evenly moist and in a very bright location just out of direct sunlight. Keep it away from heat sources and cold drafts. If possible, the plant should be taken outside to resume growth once nighttime temperatures are above 55º. At the beginning of April, cut the poinsettia back to about 4" in height and repot in a slightly larger pot. Fertilize with a balanced fertilizer every two weeks. Continue to pinch until the middle of August. When frost threatens, bring the plant inside and place in a totally dark location for at least 14 hours every night. Keep it in a bright location during the day. Water when the soil begins to appear dry, but don't allow it to either dry out or become soggy. 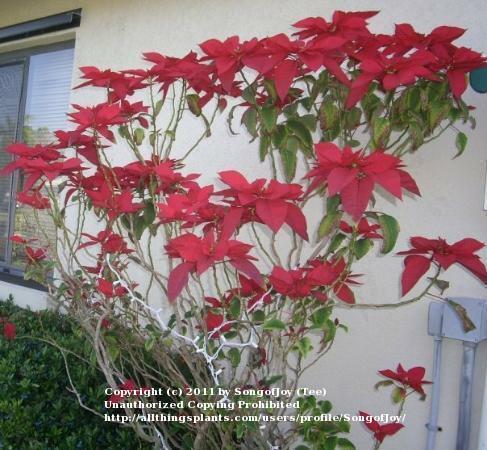 Place the poinsettia in its permanent location once coloring occurs and buds form. Many species of Euphorbias are highly toxic. Fortunately, the poinsettia is not among them. However, ingesting the plant will most likely make you sick. The sap of the plant can also cause skin and eye irritation. Handle all parts of the plant with care, especially avoiding the sap. 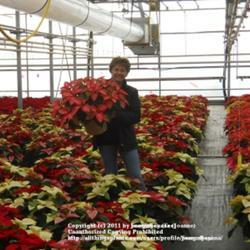 Do not place poinsettias where infants and children can reach or handle them. Christmas without poinsettias is almost unthinkable. These interesting and beautiful plants are usually quite afforable and deserve their place of prominence to be enjoyed all through the holiday season. Whether it's a single plant or a large display, nothing says Christmas quite like the poinsettia. Blooming poinsettia (2nd from top) courtesy of Wren. Top photo and greenhouse photos courtesy of Joannabanana (seen bottom L), Production and Inventory Control Manager for a large Canadian wholesale grower.